John Cotterill (Music Director) was appointed Music Director in September 1995. He was born in Hertfordshire, but later moved to Surrey where at Farnham he founded the Waverley Singers and the Waverley Orchestra, both of which he conducted until 1981. He lives in Maidenhead, Berkshire, where from 1983 to 2001 he was Conductor and Music Director of Maidenhead Chamber Choir, and where he now conducts the Norden Farm Festival Chorus and was for 10 years Director of Music at St. Luke’s Church. 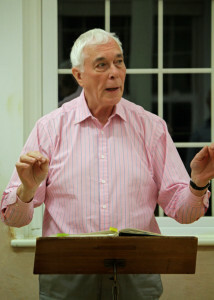 He has also conducted the Runnymede Festival Chorus and Maidenhead Symphony Orchestra. His early tuition in conducting came from Alan Fluck, Meredith Davies, Myers Foggin, Sir Adrian Boult and Sir Charles Groves. At various times he has directed the Farnham Wind Ensemble, the Haslemere Choir and Orchestra, the Woking Choral Society and the Grove Choral Society, Bournemouth. He has been Vice Chairman of Tilford Bach Society, and is a past President of Maidenhead Music Society and a past Chairman of the Southern Region Committee of the Association of British Choral Directors. 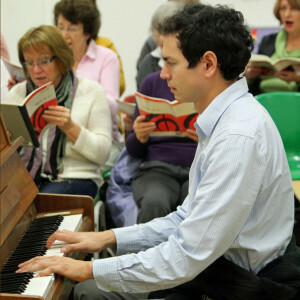 Michael has accompanied the Great Missenden Choral Society for the last twelve years. He is a graduate of Durham University where he read Physics, Philosophy, and Psychology. Having received the ARCM and FRSM diplomas for piano performance, he is now a freelance musician; his musical activities are now divided between teaching privately and in schools, accompanying instrumentalists and choirs, writing for Pianist magazine, and examining for the ABRSM. Away from music, he’s a keen golfer, travels a bit and enjoys finding high places to climb!